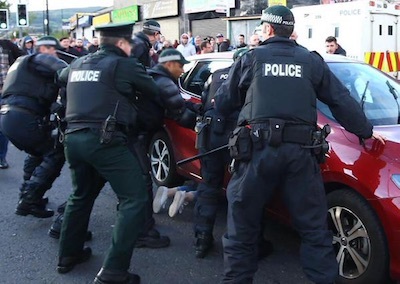 Loyalists rioted on Monday night in north Belfast and drove a vehicle into nationalist residents, seriously injuring a teenage girl, after their march was preventing from passing through the Catholic Ardoyne area. In line with previous years, the anti-Catholic Orange Order was barred from walking along the nationalist Crumlin Road due to a determination of the Parades Commission. The body has been tasked with adjudicating on contentious parade routes since 1998. Within minutes of the annual ‘Twelfth’ parade reaching the police lines, bottles, bricks and metal bolts were thrown at PSNI police, who responded with water cannon. Shortly afterwards, a vehicle driven by a parade organiser appeared to suddenly reverse into nationalist residents, striking three people and running over a 15-year-old girl. The girl was trapped under the car and sustained grave injuries to her head and neck. “It’s miraculous that she’s still alive,” said Fr Gary Donegan, of Holy Cross Catholic Church. The driver, who was wearing a band uniform and understood to be a member of the North and West parading organisation, was arrested. Sinn Fein and PSNI officials appealed for calm, claiming the girl in question was not badly hurt. PSNI Chief George Hamilton took to social media to declare that the girl’s injuries were not serious. “She’s in our thoughts,” he said. He said eight PSNI men were injured in the clashes, including one senior member. Earlier, several loyalist bands breached a Parades Commission ruling by playing music while passing St Patrick’s Catholic Church in northwest Belfast. The bands played sectarian tunes such as the ‘Famine Song’ near the church, a site of numerous sectarian displays by loyalist marchers in recent years. One bandsman was seen to spit towards the church as he passed. The British Labour’s party spokesperson on the North of Ireland, Ivan Lewis, condemned the scenes as a “serious step backwards for stability in Northern Ireland”, while Alliance Party Justice spokesman Stewart Dickson said “the image of Northern Ireland” would suffer. The Greater Ardoyne Resident Coalitions, which opposes sectarian parades through the community, said the critically injured girl had been denied immediate help from the nearby Ambulance Station, which had been closed “due to the demands of Loyal Orders to impose sectarianism on our community”. “This young girl could have been killed by a sectarian bigot who sees her as a second class citizen,” they said. The violence followed almost unprecedented displays of sectarianism at loyalist bonfires this weekend, with a record profusion of Irish flags, nationalist election posters, figures in effigy and other sectarian and political threats. The most controversial of these was the advertised ‘execution’ of Sinn Fein election candidate, Michelle Gildernew, who was depicted in effigy on a gallows on a bonfire in Moygashel, County Fermanagh. Full reports to follow in our forthcoming weekly publication.